About a year ago, someone in our audience asked us to explain the TV ads for Microsoft where the people kept murmuring something about ‘To the Cloud.’ We explained that ‘The Cloud’ was just a new marketing term for the Internet – that’s true, but it has come to mean something more personal than that. 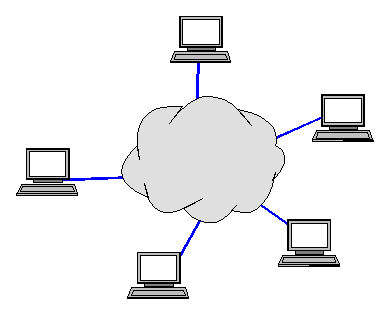 The nebulous entity that is created by many computers being connected together has always been represented in diagrams by a cloud. In one of Geeks on Tour’s earliest videos (basc11.Intro to Web Browsing), we analogized the Internet to a ‘parallel universe’ above the earth … in the clouds. We found this to be very helpful with concepts like UPload and DOWNload, for example. The Web, as it becomes more pervasive, is being used to accomplish more tasks. It started out as a place where only web-savvy programmers could create content. Webmasters created websites and the rest of us accessed the content in those sites. Now it is a place where you can put your own stuff in a password protected area – your own ‘Cloud’ – so you can access your stuff with any device. Email was probably the first example. If you use web-based email – like gmail, you could look at your email on your computer, or on someone else’s computer. Now you can use your smartphone or tablet to access the same email. All you have to do is log in. It doesn’t matter what device you use, because your email isn’t stored on any of your devices. It’s stored on the Web, in the Cloud, and you access it with whatever device is most convenient. With faster internet connections, and cheaper storage, we have the ability to put a lot more of our stuff on the web. If you use software like Carbonite or Mozy to back up your computer’s file to the Internet, a year ago you might have said, “I back up my files to the web.” Now you probably say, “I back up my files to the Cloud.” If you have an account with Google, Apple, Microsoft, or Amazon, you have a password-protected place to store your stuff. With Google it’s called Google Docs, Microsoft is SkyDrive, Apple is iCloud, and Amazon is Amazon Cloud Drive. Most any file that you store in any of these locations will be accessible by any computing device you have. This means no more worries when you leave home about what computer to take with you and what it has on it. Every year, around March, I used to buy a box from the computer store for the TurboTax software for that year. When they started making the software available on the web, I jumped on it. I had no desire to own the TurboTax software for every year, I just wanted to rent it to do my taxes each year. And, since I use the online system, it keeps my data from year to year. I only need to update the numbers. I used to say, “I do my taxes online.” Now I guess I could say I do my taxes in the Cloud. Google Docs and SkyDrive, mentioned above are also more than just online storage areas, software is included. If you have a Microsoft account and use SkyDrive, you can create documents with the online equivalent of Word. You can also create spreadsheets with the online equivalent of Excel, or presentations with the online equivalent of PowerPoint. Now we’re talking Cloud Computing. 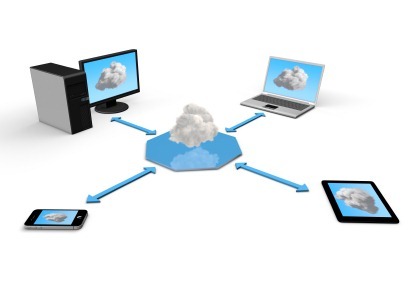 Your only need for a computing device is to be able to connect to the Internet and run the applications on your Cloud. All your computing work is done in the Cloud! Google Docs can also read and write to Word, Excel, and Powerpoint, but you’ll use the Google equivalent while working in the Cloud. 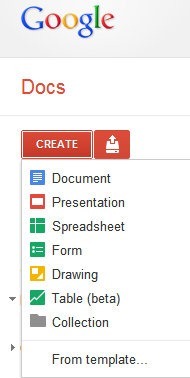 Google Docs takes spreadsheets one step further and allows you to create Forms. These forms can be embedded in websites and used as surveys or other data collection devices. Any user who sees the form can fill it out and, when they click Save – their data gets collected in the Google Docs Spreadsheet. What used to take hours of technical web programming is now just a few clicks in Google Docs. For example, this survey of your Cloud Computing usage was created with a Google Docs Form. Go ahead, take the survey – it’s just a few questions! You’ll be able to see the results after taking the survey. Take a guess what SkyDrive with its apps, or Google Docs and apps cost? Hint: I’ll bet you can afford it! They are both free. What a boon for travelers! You don’t need to take your main computer with you on the road. You don’t even need to copy important files from your main computer to your travel laptop. Just use Cloud Computing services and it doesn’t matter what computer you have. Your smartphone or iPad can even do most of your work for you. You’re free! Free to get away without losing any of your connections to family, friends or work. Your Cloud is always there, as long as you can find a good Internet connection. So, get a Google account and play with Google Docs, or get a SkyDrive account and play with the free Office Apps. This is how most computing will be done as we go forward. Better yet, register for our Techno-Geek Learning Rally April 22-28 in Bushnell, Florida. You’re guaranteed to learn lots about the Cloud! Published by MrsGeek, in Blog. Tagged with Amazon Cloud Drive, Apple iCloud, cloud computing, Google Docs, Microsoft SkyDrive. This article and related posts are so valuable to me as we prepare to leave cable and start getting ready to hit the road. Thanks to all of you. I have but have not used until now Google Docs, and have relied on access to my computer for files. I just easily transferred those files I access frequently, or may need for meetings away from home. It was so simple I do not know why I did not do it before. Now I have immediate access to that information from just about anywhere. Now, just like accessing my calendar or phone listing, I can also access my files. You’re absolutely right about Internet connections for fulltiming RVers. It is a real problem. When we’re on the road, I put my Carbonite on pause. I’ll do a backup when we have good Wi-Fi. BUT … connections are getting better all the time, and I’m afraid your analogy to buggies vs horseless carriage is right on. This is the way that computing is going – and we need to adapt. As for not having any of your data when you’re disconnected – SkyDrive has a Sync option that is pretty awesome. So anything you send from your computer to the cloud can be sync’ed – update it in the cloud and your local copy updates automatically and vice versa. Yes, that takes twice the bandwidth – but just for documents, it doesn’t really add up that bad. I just can no longer imagine a world where I have a different set of emails/calendar items etc on different devices. Check my mail on my phone … delete a few … go to my computer, they’re deleted. And, dropbox (another cloud storage/sync’ing program discussed in an earlier article) has made our seminar business possible. It doesn’t matter what computer we take to a seminar – they all have the most up to date presentations and examples – even if we have no Internet connection. It also doesn’t matter which computer we choose to use to update those files – all are automatically sync’ed with each other via Dropbox. Back to the Internet connection. I do feel sorry for fulltimers with limited data plans from their Cell provider. We have a 4G mobile hotspot from Verizon on a 5GB plan and it is very distressing how fast we can go thru that limit! Jim now has a Droid Razr – grandfathered with an unlimited plan! He set up a hotspot app on it – then our WiFi Ranger router picks that up and we have unlimited 4G Wi-Fi in our rig. or 3G when 4G isn’t available. We hit the road next week and we’ll be writing more about that. You might be interested to read The Big Switch: Rewiring the World, from Edison to Google. The transition we’re going thru now is really more like the development of the power grid back in Edison’s time. Do the power companies make a lot of money – sure – but it also made it possible for everyone to have power. Today’s Cloud levels the playing field for small businesses who could never afford an IT department. I concur with David. The entire time I was reading your article I was thinking how naive we are — again. I don’t want to be a buggy whip maker complaining about the new fangled horseless carriage, but all my data in the cloud means when I’m not connected — by any device I own — I have NO data. You mention only one time, “… as long as you can find a good internet connection.” I say, even if I did have a good connection, would I still want all my personal information stored somewhere other than my machine? And the software the uses it? I have huge space, lots of cycles — why go back to the IBM “big blue” days? Unless we’ve forgotten. I would like to see you write about the “real” reason the industry is moving to the cloud. Think $$$ and less power in the peoples’ hands. While this is probably great for most folks, I find it distressing as I am a full timer and rarely have a fast Internet connection. I am usually on my MiFi device and pay $80.00 a month for 10 gig of data. Using something like Carbonite is way to slow and expensive. Any activity in the Cloud is slow and expensive. Just my two cents. Shoot me down if you can. I would love to be made aware of alternatives.